Servicing aviation needs under International Civil Aviation Organisation (ICAO) regulations is one of the most important tasks of Met Éireann. A substantial part of our resources is dedicated to this task, with a corresponding proportion of our budget being recouped on a cost recovery basis through route charges. Met Éireann’s Aviation Services Division (ASD) core function is to provide or arrange for the provision of operational aviation related weather information. These meteorological services are governed by ICAO standards and, also, European Single European Skies Regulations. The primary consumers of ASD services include the Airlines, Air Traffic Control, and Airport Authorities, Search and Rescue services and general aviation. Under ICAO obligations the ASD must also ensure the maintenance of a ‘meteorological watch’ over Irish airspace to warn of phenomena that are hazardous to aviation. This involves observations at airports and aerodromes by experienced observing staff. 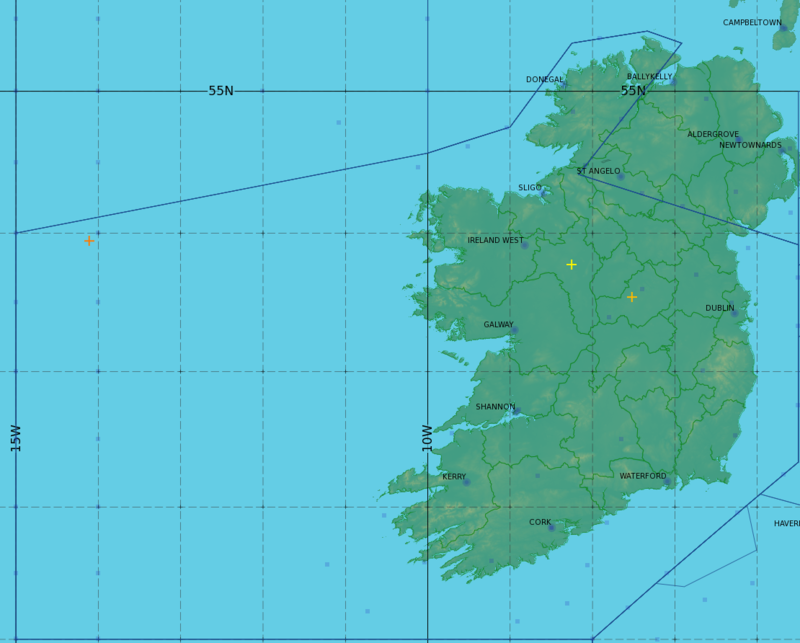 The following image shows the airspace that Met Éireann maintains weather watch for; the Irish Flight Information Region (FIR). A SIGMET is a weather advisory that contains meteorological information concerning the safety of all aircraft. The advisory can cover events such as thunderstorms, severe turbulence, severe ice, severe mountain waves, and volcanic ash for example. In addition to the regulated services, ASD also provides/arranges for the provision of bespoke products to further assist the aviation community in its operations and decision making processes. The ASD is accredited to an ISO Quality Management System standard. Aviators can avail of aviation briefings from Met Éireann’s Aviation Forecasters by dialling 1570 234 234. Calls cost a maximum of €2.40/minute. The rate charged will depend upon the phone service provider, but it cannot exceed €2.40/minute. Met Éireann via the ASD provides a free web-based Met Self Briefing (MSB) service for the provision of aviation data (Meteorological Terminal Aviation Routine Weather Report METARS and Terminal Aerodrome Forecasts TAFS etc) to pilots and aviation customers (https://briefing.met.ie/). Meteorological Services for the Defence Forces and meteorological training are provided at Casement Aerodrome. Met Éireann is in the process of upgrading its aviation observing systems through a project called the Aviation Modernisation and Automation Project (“AMAP”). The project will modernise Met Éireann’s aviation surface observation network, and with the exception of Dublin, automate aviation surface observations. This goal is primarily driven by the requirement to provide safe and effective observations which meet all EU and International Civil Aviation Organisation (ICAO) standards. The ASD is based in Shannon Airport but it has offices in Cork, Dublin, and Knock Airports as well as in Casement Aerodrome.